The August Canada Craft Club packages are being sent out on the last breath of summer! We’ve got them packed with tons of goodies to enjoy on the patio, after school supply shopping, or take them camping with you for the Labour Day long weekend! Check out what our other packages got sent! Jealous? Order exactly what you want at our online store. Category 12 is founded on the principles of science that translate to great beer. Head Brewer and owner, Michael Kuzyk, has his doctorate in microbiology and biochemistry and puts his smarts to good use. On Vancouver Island, they create five year-round core brews but release seasonal small batches that typically only reach the thirsty hands of West Coast quaffers, and it is a small window to get ahold of these brilliant specimens of science. With that in mind, we made sure to secure a Category 12 seasonal release that has not been featured before. A Red Ale using hops that can sometimes be hard to find, like the esteemed Opal, and adding in Jarrylo hops (named after Jarilo, the Slavic God of springtime and fertility) with a house-Belgian yeast strand, and a CaraRed base malt, we’re left with an outstanding concoction. Dive in and enjoy within a month, chilled to 6 C.
We sound like a broken record, but Portland’s beer scene is full of incredible breweries. Their passion for beer has been long-standing and they’ve now hit a whopping 112 breweries with a citywide IBU rating of a staggering 43. They clearly have a palate for the bitter! 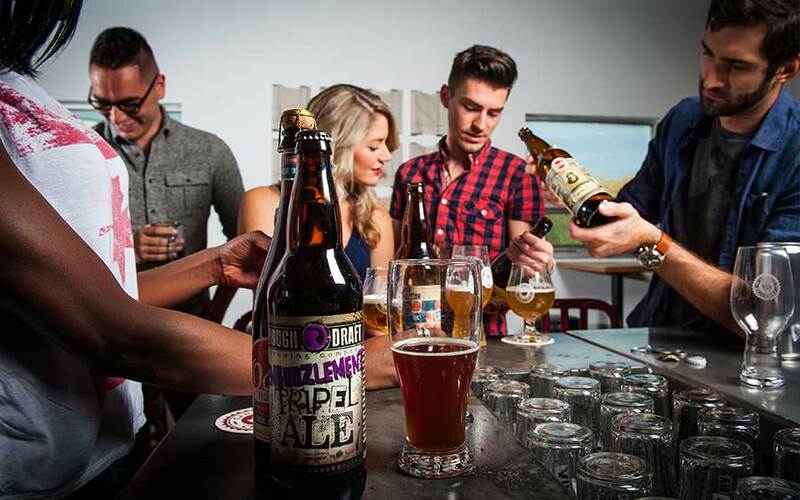 So it has become completely necessary for Portland brewers to look for original, creative and tasty new recipe’s to stay relevant while balancing out the need to quench the traditional palate. Alameda has been brewing up great Ales and Lagers for the Portland public for 22 years now. That sort of longevity in the heart of ‘beer-vana’ is in its self a major accolade, and their many awards, including two gold medals at the Great American Beer Festival, don’t hurt either. Today we’re presenting you with their take on the classic Amber Ale, but made in the Pacific Northwest way, hop-fully delightful. Enjoy while it’s fresh, at 7 C.
A few things you probably didn’t know about Asheville, North Carolina: it was the beautiful backdrop to 2017’s multi-award winning drama Three Billboards Outside Ebbing, Missouri, it was the backdrop for part of 1994’s multi-award winning film Forrest Gump, and it is home to 2014 World Beer Cup Gold Medal winner and 2018 Bronze Medal winner, Asheville Brewing’s Ninja Porter. As amazing as the accolades are, another kudos has to be given to the creative landscape of their public space. At present, their movie theatre page boasts of showtimes for Goonies and other blasts from the past. Yes, they have a movie theatre and a menu that apparently has all of Asheville wrapped around their ninja finger. At the heart of it all, it’s the beer that brings the people in. Drink this knowing it is perhaps one of the finer Porters you will ever have. Drink at 7 C, but there is no immediate rush to enjoy. What makes the craft beer industry so appealing, is the artistic creativity brewers have with each recipe. The creation of new styles and new methods of brewing while raising a glass to traditions of old paves the way for a celebration with each sip. Upland has a brewery called the ‘Woodshop’ that is exclusively devoted to the high-end production of wood-aged Sour Ales. Using wood for ageing gives the brewer a plethora of tasting profiles. Then there is the beer that goes into the barrel, a balancing act with risk, but ample rewards with patience. Therefore, the entire process is an act of engineering and artistic expression. Here we have an outstanding example of this traditional Belgium process done with a twist. Relish in the flavours, this is a beautiful beer that deserves some attention. You can put this beer away for a while, but it’s ready to enjoy now, chilled to 9 C. Please note, bottle date is 2017 and this beer ages beautifully. 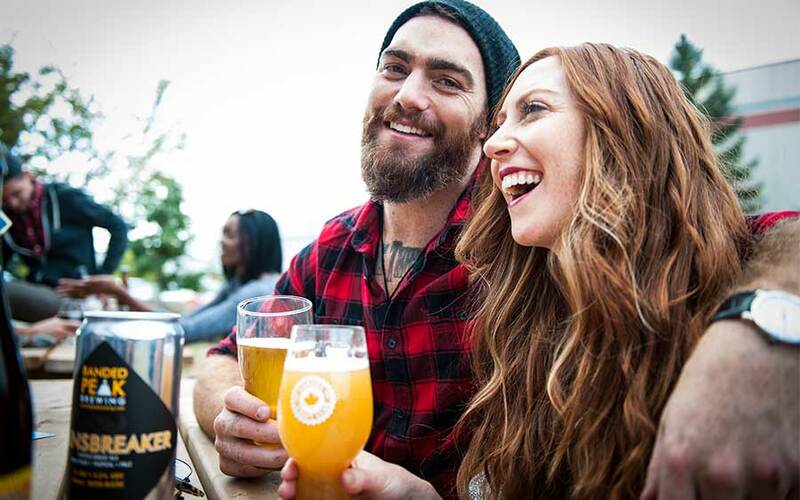 Bend, Oregon is one of many hot spots that will go down in history as a hub for outdoor enthusiasts, and makers of world-renowned craft beer. We visited each brewery on the Bend Ale Trail last year, and came back with about 20 new faves! One brewery in particular really delivered with great brews and an amazing atmosphere. This month, we are really proud to deliver the Half Hitch Imperial India Pale Ale from the Crux Fermentation Project. This big Mosaic hop-fronted brew, made by Larry Sidor, owner and former Brewmaster at Deschutes Brewery, has only been available on a couple of rare taps for a short time in BC and Alberta, and this bottle is a nation-wide first to market, shipped exclusively for our members. The brewery is situated with an incredible view of the Cascade Mountain range with legendary sunsets. Kick back, relax and enjoy this sunset worthy, mountain-of-a-beer. Chill to 8 C.
We get really excited when we can present you with a beer from the opposite side of the world, especially one so rare it has less than four ratings on Ratebeer.com! It is also this month’s second Barrel Aged Fruit Sour, but a completely different beer. Instead of fresh oak, we see New Zealand’s terroir of water, barley, hops and naturally occurring yeast, with blackcurrants added before sitting for two years in Pinot Noir barrels. These barrels tend to be readily available in a region where Pinot is king. What makes 8 Wired really interesting is they were breaking ground in the craft beer world at a time when wine dominated. After contract brewing for years, they settled into their own brewery in 2004 and have now prestigiously been recognized as one of the Top 100 Brewers in the World from ratebeer.com. Enjoy this beauty at your leisure, and serve chilled to 10 C.
Left Coast Brewing (on the coast halfway between Los Angeles and San Diego) has been making incredible waves with their IPAs. This, their iconic Trestles IPA is the one that put them on the map, even though it was simply made as a tribute to their local surf spot. Trestles is a series of spots that host the World Surf League World Tour annually, so naturally, word of this brew quickly grew. Left Coast soon began to receive accolades as modest as ‘best IPA in California’ to medal placing rounds from Australia to the New York International Beer Awards. They now have two locations, the second also housing a distillery and smokehouse. They are known locally for laid-back charm and promoters of surf life. We’re proud to present you with this IPA, which achieves balance in malt and hops to create such a quaffable brew without sacrificing anything. Drink within a month, chilled to 6 C.
Why should you go to beer festivals?